Casseroles may have had their heyday in the middle of the last century, but there's a reason they continue to be a home cook favorite. Actually, there are a number of reasons and most of them boil down to convenience. In addition to being a one-pot meal, a casserole can go straight from the oven to the table, which means there's almost no cleanup. And once that baking dish is in the oven, there's no basting, rotating or fussing of any kind—you can pretty much set it and forget it. Since casseroles can be made in advance, they're like having an easy, effortless meal in your back pocket. And, they're a great way to use up leftovers, like all those half-full boxes of pasta in your pantry or the rest of last night's roast chicken. Whatever you do, gather a crowd. Casseroles are perfect for parties and potlucks. And they needn't be limited to lunch and dinner. Strata and baked French toast bring casseroles to the brunch or breakfast table, while bread pudding and fruit crisps and crumbles are essentially casseroles you make for dessert. To help you enjoy everything casseroles have to offer, here are 11 casserole tips including how make slow cooker casseroles and how to freeze your a casserole without a baking dish. If you're all about the crunchy topping, use a shallow dish. Shallow dishes cook more quickly and offer lots of surface area for all that browning and crisping we love so much. Any ovenproof dish will do, including those made of ceramic, metal or glass. Just remember that ceramic heats up slower than metal or glass, which may affect the total cooking time. So if you're in a rush, go with metal or glass. You'll notice that many detailed cookbook recipes call for a 9- by 13-inch baking dish, but go ahead and use the shapes and sizes that you already have at home. It's not that serious, it's just a casserole. You can even use ramekins for individual servings. For parties and potlucks, keep thinks simple and use lightweight aluminum foil pans that are disposable. No cleanup = more party time! Firm pasta holds up best in a casserole, so if your recipe calls for pasta, cook it just shy of al dente or about 2 to 3 minutes less than the package instructions indicate. You'll have perfect pasta every time. Or change things up from time to time: for added flavor, fry the pasta for a few minutes, stirring constantly, until browned, but not burnt, and it smells toasty. 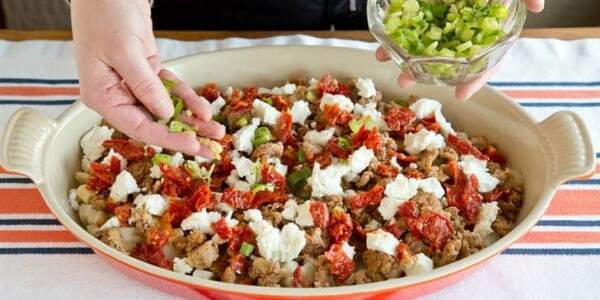 Shredded chicken, diced ham, ground turkey or beef, sausage and bacon—almost any meat can be incorporated into a casserole. Always cook the meat first and drain it on paper towels to avoid a soggy or greasy casserole. One exception: if you're using a lean poultry like ground white turkey or ground white chicken, you'll need every bit of fatty flavor. Most vegetables, including green beans, various squash, mushrooms and hearty greens like Swiss chard, should be blanched or cooked before they go in a casserole. Broccoli and cauliflower can be added raw, but roasting makes them particularly soft and delicious. Frozen vegetables are an easy option, but you'll need to remove any excess water. Greens like spinach can be defrosted and squeezed out, while carrots, corn and green beans can be thawed in a colander. It's no surprise that cheese is the star of many of the most popular casseroles, including lasagna and macaroni and cheese. To optimize the ooey-gooey factor and boost the flavor of a casserole, feel free to swap in different varieties of cheese, but keep in mind what each one brings to the mix. Feta and blue aren't melting cheeses, but they're great sources of tangy flavor and can be combined with more melt-able varieties like cheddar and Gruyére. Reduced-fat and fat-free cheeses will never taste as good as the real thing and don't melt very well. 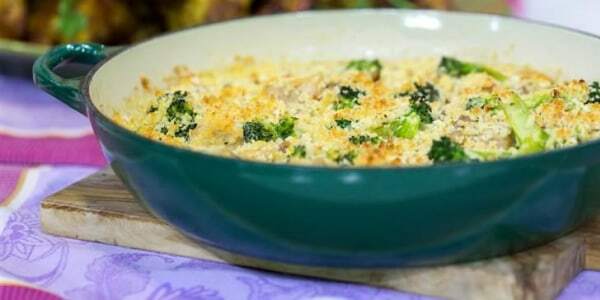 For a more health-conscious casserole, swap in a small amount of light cheese or simply use less cheese overall. Pre-shredded cheese is a time-saver, but it has less moisture, so your casserole may end up a little drier than usual. If you need to go dairy-free, swap out the cheese for a layer of celery root puree which has a creamy mouthfeel that's similar to melted cheese. Fill your casserole dish until it's about three-quarters of the way full so you can leave room for the ingredients to bubble up. If you're worried about spillover, set the casserole dish on a baking sheet before placing it in the oven. Covering a casserole allows for steam, which means less browning and crisping on the surface; add a lid or foil if the top is cooking too quickly. 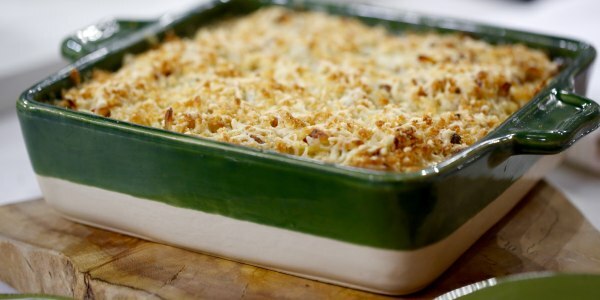 To create a crisp, crunchy topping, sprinkle your casserole with breadcrumbs. Any store-bought crumb will do, but panko is wonderfully flaky and delicate. Even better: Make your own crumbs by quickly blitzing leftover bread in a food processor—toss in some grated cheese, herbs or spices for extra flavor. Fried onions, fried shallots, crumbled bacon and shredded cheese are other great topping options—you can even sprinkle crushed potato chips or tortilla chips on top. 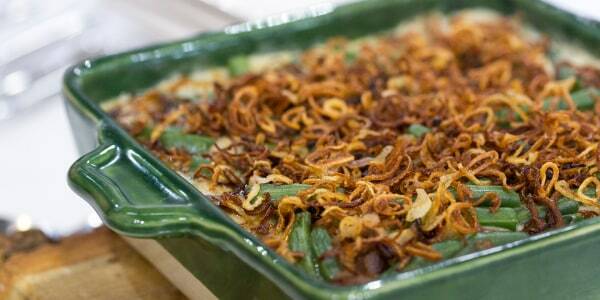 If you're making a casserole ahead, wait until just before baking to add the topping. In a pinch top your casserole with frozen Tater Tots and bake until golden brown. 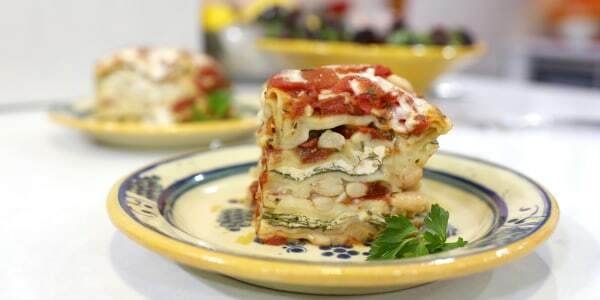 Most casseroles can be made ahead and refrigerated for a day or two or frozen up to three months. Not only is this convenient, but it also lets the flavors mingle and fully develop. 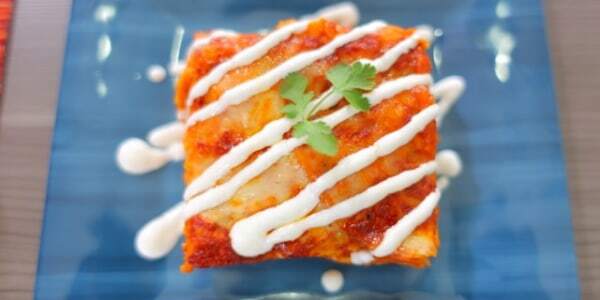 Frozen casseroles should be well wrapped in heavy-duty aluminum foil. Skip the plastic wrap; it's not oven-safe and it's too easy to forget to remove it. To ensure even baking, allow at least 24 hours for a frozen casserole to fully defrost in the fridge. 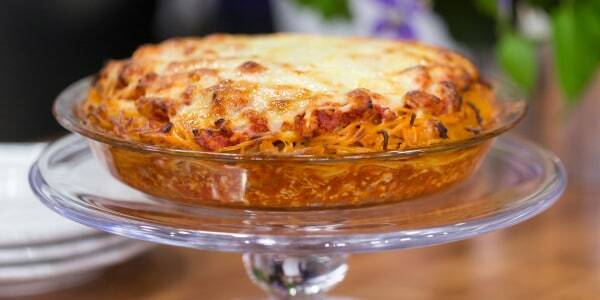 It's handy to have a casserole or two in the freezer, but tying up all your baking dishes is less than ideal. Disposable aluminum foil pans are one solution. Here's another: Before you make a casserole, line the dish with foil, leaving several excess inches on all sides. Next, assemble the casserole, fold the excess foil over the top to cover, and pop everything in the freezer. Once frozen, lift the casserole out of the dish, wrap it in a second layer of foil, and return it to the freezer. When you're ready to enjoy the casserole, unwrap it, place it back in the baking dish, thaw completely, and bake per your recipe. The casserole concept is a flexible one and once you make a couple you'll get a feel for what does and does not work. 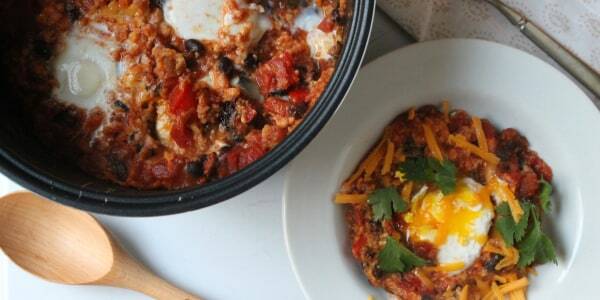 Have some fun and play around with different ingredients and combinations like using layers of tostadas or tortilla chips to make a huevos rancheros casserole. 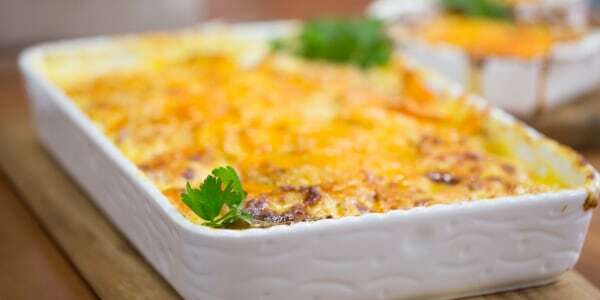 Take some risks and dare to add some eggs on top of a saucy casserole for the last 10 minutes of baking--the result could be absolutely amazing but you won't know unless you try it. If you're nervous about an idea, try making it in a smaller baking dish first, but keep in mind that casseroles tend to be forgiving and most of the time, they work out just fine.